If you are looking for a perfect Suzuki Car but you are at the low budget? Are you want to exchange your old car with a new one? 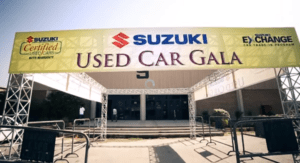 Suzuki Used Car Gala is really something that can help you. You can buy and exchange your Suzuki car with a new one or with the new model at the lowest prices. The Suzuki Used Car Gala is going to take place at four major cities of Pakistan with thousands of dealers and cars. Hurry up, don’t miss this amazing chance and get your car now with one year warranty. Suzuki presents its used cars on this event for sale to the people who are the tight budget and want to get some discounted prices for cars. The details of the cars are mentioned below to facilitate you. The cars are not too old and used. All the cars are in better condition. The available car models are not older than the 5 years. It means that you will get the cars who were launched after 2013. Moreover, all the cars are not too much derived. Almost every car is driven less than 75,000 km. Suzuki has refurbished every car and has ensured its reliability. That’s why these are guaranteed. The cars are checked by Pak Suzuki Motor Engineer and Pak Suzuki extends the warranty on the cars. One year guarantee of each car purchased or exchanged. Easy document creation and verification. Islamabad: Tulip Marquee III, Club Road, Islamabad. You can catch this great event on 5th August 2018, Sunday. The gala will start at morning 10:00 AM and will end at 6:00 PM. The date and timing for this event are the same for every city and location. This gala is not specifically allowing you to buy the cars instead you can also sale and exchange your cars. Selling a Suzuki is not that easy before. Now, you can sale your Suzuki car at this gala and can get handsome amount of this. If you are on a low budget and can’t buy your new Suzuki car, then this is a perfect time for you to buy the furbished car. You will get the best car at the affordable price and the model is also not too old. You can also exchange your old Suzuki car with a new one. With easy document procedures, you can get a new model of your Suzuki while giving ways the old one.